We’d love your help. Let us know what’s wrong with this preview of Buffalo Unbound by Laura Pedersen. Writing about the economic collapse and social unrest of her 1970s childhood in Buffalo, New York, Laura Pedersen was struck by how things were finally improving in her beloved hometown. As 2008 began, Buffalo was poised to become the thriving metropolis it had been a hundred years earlier—only instead of grain and steel, the booming industries now included healthcare and Writing about the economic collapse and social unrest of her 1970s childhood in Buffalo, New York, Laura Pedersen was struck by how things were finally improving in her beloved hometown. As 2008 began, Buffalo was poised to become the thriving metropolis it had been a hundred years earlier—only instead of grain and steel, the booming industries now included healthcare and banking, education and technology. Folks who'd moved away due to lack of opportunity in the 1980s talked excitedly about returning home. They mised the small-town friendliness and it wasn't nostalgia for a past that no longer existed—Buffalo has long held the well-deserved nickname the City of Good Neighbors. 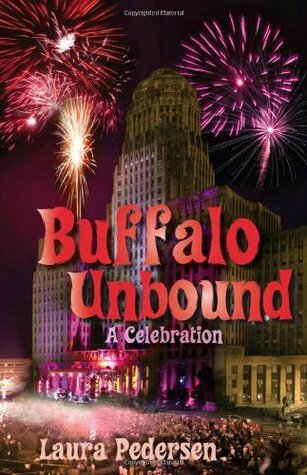 To ask other readers questions about Buffalo Unbound, please sign up. Sydney, Monaco, Madrid, Dubai, Majorca, and South Africa are just a few of the places I hope to visit in my lifetime. I have always been drawn to the exotic locales. The U.S. is OK, too. I have been to Alaska twice, had a nice one-day layover in Seattle, multiple trips to Florida and Georgia, a two-week sojourn in Lincoln, Nebraska, and a mad dash through O'Hare airport to catch a connecting flight. All of it was in good fun. So much can be found right in our own backyard, and we don't even real Sydney, Monaco, Madrid, Dubai, Majorca, and South Africa are just a few of the places I hope to visit in my lifetime. I have always been drawn to the exotic locales. The U.S. is OK, too. I have been to Alaska twice, had a nice one-day layover in Seattle, multiple trips to Florida and Georgia, a two-week sojourn in Lincoln, Nebraska, and a mad dash through O'Hare airport to catch a connecting flight. All of it was in good fun. So much can be found right in our own backyard, and we don't even realize it. I've lived in New York most of my life, but I have never really felt the desire to explore the state. One city, Buffalo, was never on my list of places to visit, that is until I read Buffalo Unbound by Laura Pedersen. The possibility of participating in the National Buffalo Wing Festival next Labor Day seems like way too much to pass up. The vivid descriptions of the various food festivals were enough to make me a convert. So what if the weather is bad during the winter when you have the fun of trying to wiggle out of your snowshoes!! "The universal Buffalo sport, or maybe it's more of a dance step, is the flamingo. This where you stand on one foot while yanking on or off your boots. It's easy to spot Buffalonians and other Snowbelters in airports -- people of all ages, shapes, and sizes deftly removing shoes while holding luggage without needing to sit down or even balance against the metal detector. It's an acquired skill, like thumping bricks of greasy black snow off from underneath the car without getting your shoes or pant legs dirty." Author Laura Pedersen knows all to well about the wonders of Buffalo, having grown up there. Her love for this city was part of the inspiration for writing Buffalo Unbound. A Forbes magazine article disparaged her hometown, calling Buffalo one of the ten most miserable cities to live in. Those were fighting words, the article also prompted Pedersen to cancel her subscription to Forbes. When I think of Buffalo several things come to mind: a football team that was 0-8 until Week 10, cold weather, snow, and a horrific plane crash. But that is a very short-sighted view, there is much more to Buffalo. Its citizens are not miserable, they are quite lovely. Everyone came together following the plane crash in February 2009. More than 4,000 volunteers showed up to help build a house for an episode of Extreme Makeover: Home Edition. People take pride in shoveling their lawns and driveways following a snowstorm, including those who continue to shovel while the snow is still falling. The kindness of people isn't just restricted to the modern era. Father Nelson Henry Baker was always thinking ahead in the late 1800s. He helped the local church get out of debt, helped spearhead the discovery of natural gas in the area surrounding the church, and helped unwed mothers with prenatal care and adoption services. To hear Pedersen describe it, Buffalo is a place where you can take a breath. You can actually enjoy your surroundings, including Forest Lawn Cemetery. Yes, a cemetery. Rick James is buried there, so is a former President -- next to his two wives. It's even a popular backdrop for wedding photos. A bit unorthodox, but it doesn't sound very dreary to me. There are so many things about Buffalo, it's hard to contain it in a review like this. At the start of this book I had no desire visit, but now I think I will. But I will be sure to bring a flashlight when I visit City Hall (I hear you need one! ), and promise not to make jokes about the ever-present snow (I also hear that's a NO-NO!). Laura Pedersen wrote a hilarious book titled Buffalo Gal, about her life growing up in the snowy city of Buffalo, New York in the 1970s. As I grew up in Auburn, New York, two hours away but just as snowy, I totally related to her stories of making your way through feet of snow to get anywhere. I literally doubled over with laughter at Pedersen's skewered sense of humor about her family, friends and hometown. Now she has written a new book, Buffalo Unbound, telling why Buffalo is such a great city Laura Pedersen wrote a hilarious book titled Buffalo Gal, about her life growing up in the snowy city of Buffalo, New York in the 1970s. As I grew up in Auburn, New York, two hours away but just as snowy, I totally related to her stories of making your way through feet of snow to get anywhere. I literally doubled over with laughter at Pedersen's skewered sense of humor about her family, friends and hometown. Now she has written a new book, Buffalo Unbound, telling why Buffalo is such a great city. Buffalo has taken it's share of knocks over the years, losing industry, jobs, and population. But a turn around occurred when The New York Times ran a story a few years ago about people who were moving from New York City to Buffalo to take advantage of the inexpensive, spacious housing and opportunity that a city trying to recover affords young families. Pedersen recounts canceling her subscription to Forbes magazine after it ranked Buffalo #8 on its list of Top Ten Most Miserable Cities. She decides to give the reasons why this is not true by writing this book. She starts with the fact that since so many people have left Buffalo, there is plenty of room, and you never have to wait in line for anything. No traffic jams, no getting to the beach at sunrise to get a good spot. Buffalonians have always been tough, and Pedersen illustrates this by telling of Margaret St. John, who refused to move her nine children during the war of 1812 when the British were on the way to burn the town. The British general was impressed by St. John, and left her family home alone. Pedersen explains that her own neighbors also had nine children and went on family vacation just once in 30 years, and so she understands St. John's position perfectly. She wasn't taking all those kids anywhere. Buffalo has always been very staunchly Catholic, and the story of Father Baker explains this. In the late 1880s, Buffalo was beginning to discover pockets of natural gas. Father Baker got $2000 from his bishop and invited drillers from a gas company to come drill on church property. They struck gas, and the money from the wells went to provide services such as the Infant Home, Working Boys Home, and as the Great Depression struck, Father Baker was able to provide food, medical care and clothing for hundreds of thousands of Buffalonians. Father Baker has been placed in nomination for sainthood in the Catholic Church, and his influence is felt to this day in Buffalo. "Western New York holiday gift list: generator, chain saw, wood chipper, carbon monoxide detector, Yaktrax (chains for your shoes), Buffalo Sabres Snuggie." If you know what she's talking about, you will appreciate this book. Ethnic festivals, chicken wings, the polka, the disappointing Buffalo Bills, Frank Lloyd Wright, and sponge candy- all of these get their due in this interesting book about the pride of being from Buffalo. "No, Buffalonians have it right. Join the club and pay your dues. Find others. Celebrate your joys and mourn your losses together. Stick with the herd. Swim with the school. Stay with the flock. And my mother says to wear a hat." Pedersen blends humor with history in this love letter to her hometown. In the days when we are all seemingly connected only by the internet, this book is a welcome reminder about the importance of a true community like Buffalo. Laura Pedersen's first autobiographical novel Buffalo Gal was about growing up in Buffalo in the 70's. Buffalo Unbound is an extension of that book. Buffalo Gal is an excellent book but does not have to be read before Buffalo Unbound. Buffalo Unbound contains a number of short stories about a variety of topics. Buffalo is finally coming out of the depression caused by the steel and car industries and is starting to thrive again. The new booming industries include: health care, banking and educa Laura Pedersen's first autobiographical novel Buffalo Gal was about growing up in Buffalo in the 70's. Buffalo Unbound is an extension of that book. Buffalo Gal is an excellent book but does not have to be read before Buffalo Unbound. Buffalo Unbound contains a number of short stories about a variety of topics. Buffalo is finally coming out of the depression caused by the steel and car industries and is starting to thrive again. The new booming industries include: health care, banking and education. Pedersen has written about the history, climate, arts and culture and shopping places of Buffalo. I believe this book is geared mostly to those who live around the Buffalo area or intend to visit. Several of the stories are written almost like a stand-up comedy routine, just plain funny. A great book for learning about Buffalo from someone who grew up in the area. There seemed to be many inside jokes that I felt left out of since I have only lived here since attending college. There was little organization to the book but it didn't matter too much. Don't expect the book to read as a guide book for tourists. This mainly sheds light on the interesting history of everyday Buffalo that we take for granted. What fun to read about growing up in Buffalo (Amherst actually) and to name drop restaurants, stores, historical sites, etc. Fun book for reminiscing for those of us who have moved beyond Western NY. This was one of my First Reads wins and I wasn't sure what to expect. I am not really interested in Buffalo for any reason. That being said, I really enjoyed this book! Laura Pedersen's writing style is witty and engaging and I hope she writes more! She'll be at my store in October and I'm looking forward to reading it beforehand. Got a bunch of ar's in the store. Long-winded at times, but Pedersen provides enough humor in her anecdotes and asides, plus some interesting tidbits about my current city, to make this a pretty good read. The book was full of facts and also full of her superfluous personal stories.This book is for people who don't know much about Buffalo and want to learn. AuthorsOnTheWeb Internet Marketing/Publicity campaign for author Laura Pedersen.